Barcelona was the first city I'd ever visited in Spain. Having learned French in school, I somehow managed to navigate the city relatively well with only 'hola,' 'buenos dias,' and 'gracias.' Ok, ok, so many of the locals knew English. My two day trip to the vibrant city was far too short, but I managed to fill it with as many tapas as humanly possible, so that's something...right?? Arriving on a morning flight from Vienna I'd only made by mere minutes (leaving an hour before your flight, not a good idea), my first stop in Barcelona was an ibérico ham tasting. Having arrived a bit early, however, I took a quick detour to the nearby Palau Güell instead. 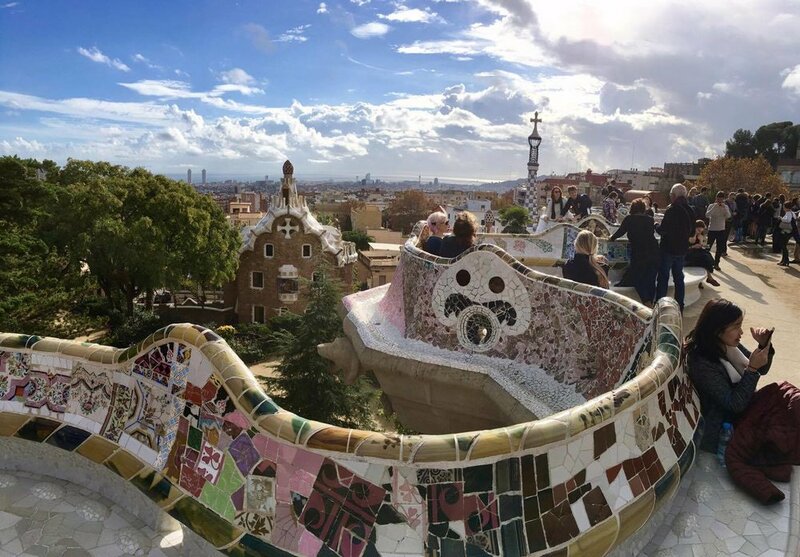 Designed by Antoni Gaudí for the Güell family, this mansion stands out with its wavy, uneven exterior in an otherwise ordinary street with uniform facades. 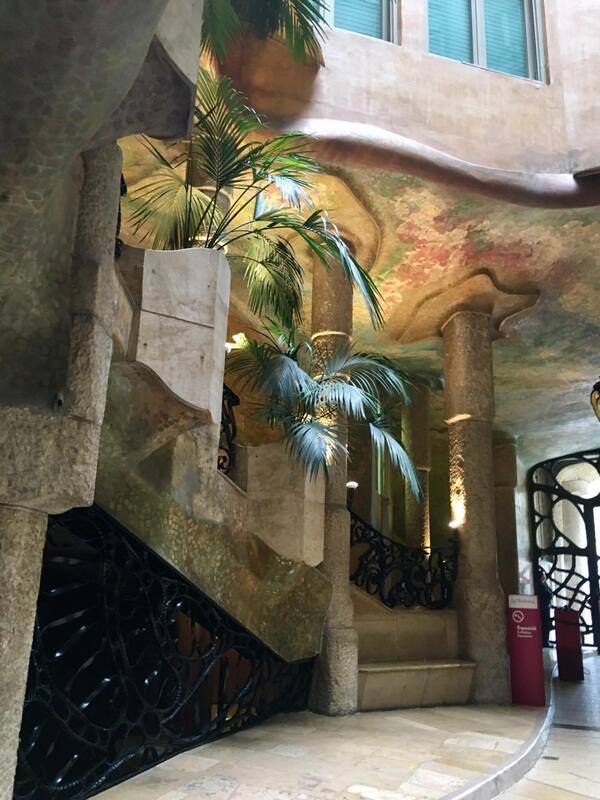 Being the first work of Gaudí I'd ever visited, I was impressed by his use of curved lines in architecture. To the untrained eye, his style seemed somewhat gothic, and I wondered if the peculiar twists and turns of his designs might be slightly eerie for residents at night. The terrace of the mansion, with colorful mosaic statues featured against the backdrop of Barcelona. Finally, time for ham tasting. It turns out the venue that runs tastings is also a museum for Spanish iberico ham. I didn't go inside the exhibit, but it looked interesting. We were introduced to six different types of ham, beginning with Serrano, the lowest grade ham, on to Ibérico, which is a higher, and fattier grade. Finally, we sampled four types of jamón ibérico de bellota from different regions. This is the highest grade of ibérico ham, from free-range, acorn-fed Iberian pigs. Tastes like happiness. The four types of ham at the bottom are bellota, from acorn-fed pigs. The top left is serrano, and the right normal Ibérico. Notice how the bellota hams have glossier texture compared with the other two. Cones of ham are sold in the grocery store below and around the city, a perfect, savory stack. 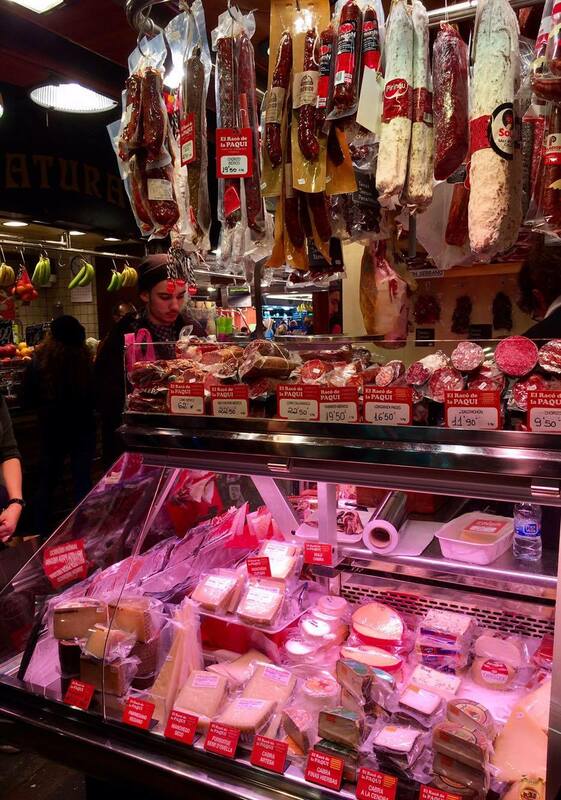 On the topic of food, one of my favorite stops in the city was the Mercat de Sant Josep de la Boqueria. One of the largest open-air food markets in the middle of Barcelona, it is where many locals buy their food, and at some point, you can't help but ask if there is anything you can't find here. A butcher selling pig hooves, and tripe. Dim sum, anyone? 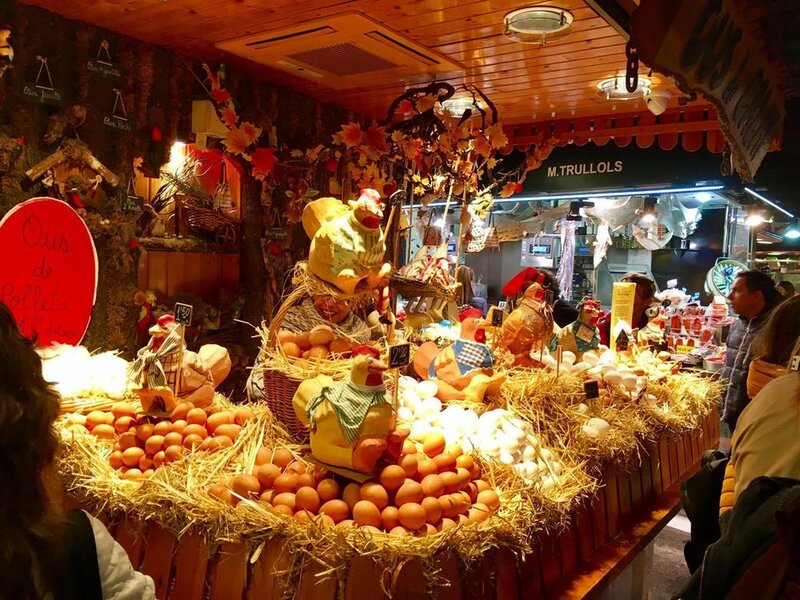 Something painfully adorable I learned in the midst of the market was a Christmas tradition particular to the Catalan region. 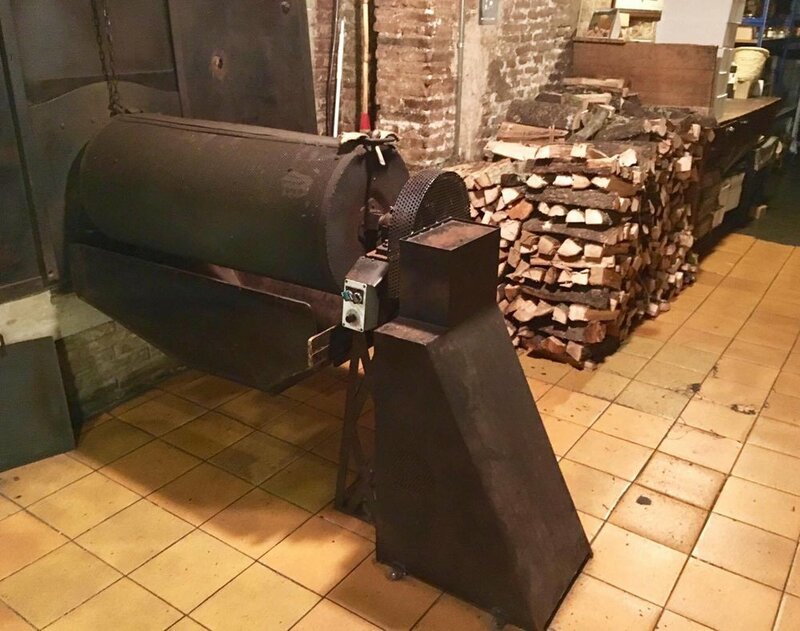 Instead of Santa Clause, they believe in the Tió de Nadal (Christmas log), which you must feed throughout the days leading up to Christmas in the hope that it will poop presents on Christmas day. Like I said, painfully adorable. 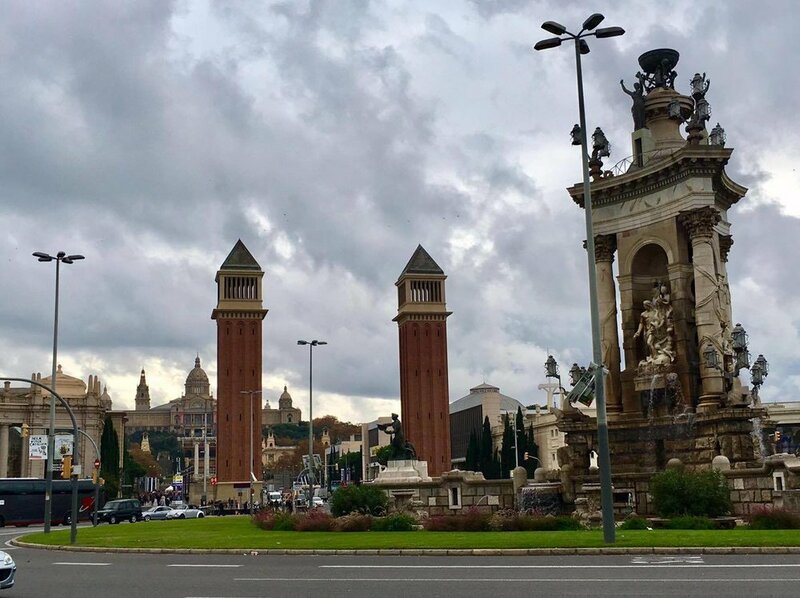 Though it was a gloomy afternoon, I decided on a trip to the nearby Montjuïc, which features a castle and park nestled into the namesake mountain on the southwestern corner of the city. 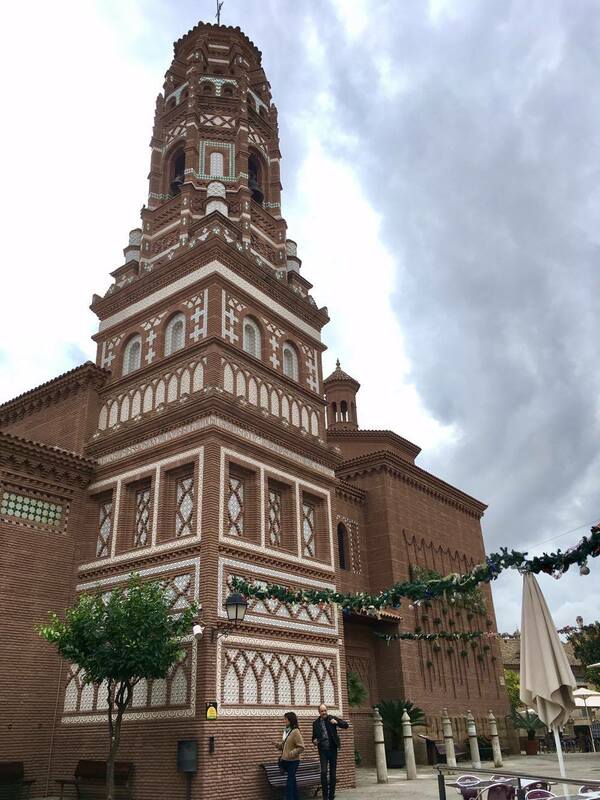 For my visit, I asked to be dropped off at the Plaça d'Espanya, and made the 15 minute walk towards Montjuïc. Today, the castle is home to a museum. Nearby, Poble Espanyol (Spanish village) seems to be a constructed tourist site meant to be reminiscent of various villages around Spain. Inside, there are small stores, restaurants, and reconstructed landmarks. Maybe its the gray skies, or light drizzle that day, but it seemed somewhat empty on my visit. 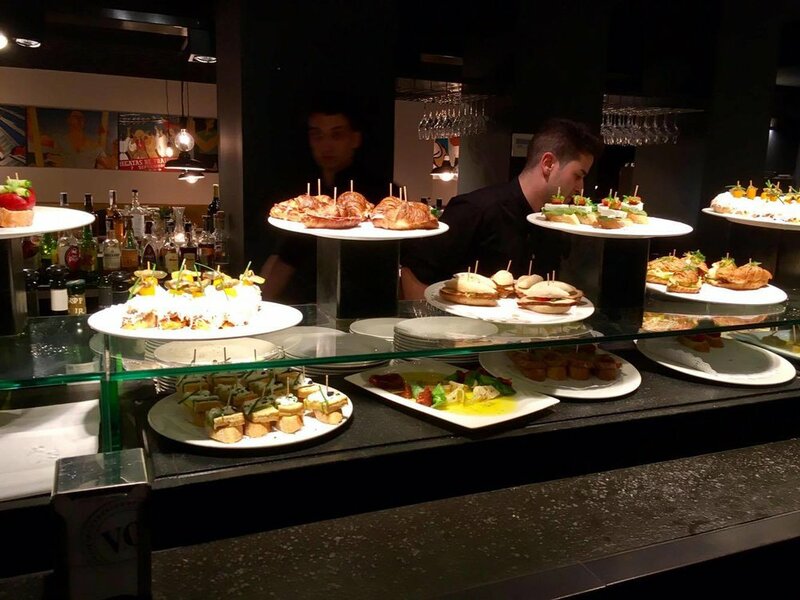 Pinchos are a type of tapas typically served on bread, held together by a single toothpick. They are traditionally found in northern Spain. At these establishments, you take what you desire from the plates on offer, and waiters will charge you based on the number of toothpicks left on your plate. In some places, the tips of the toothpicks vary in color, reflecting a different price in the pincho it holds together. 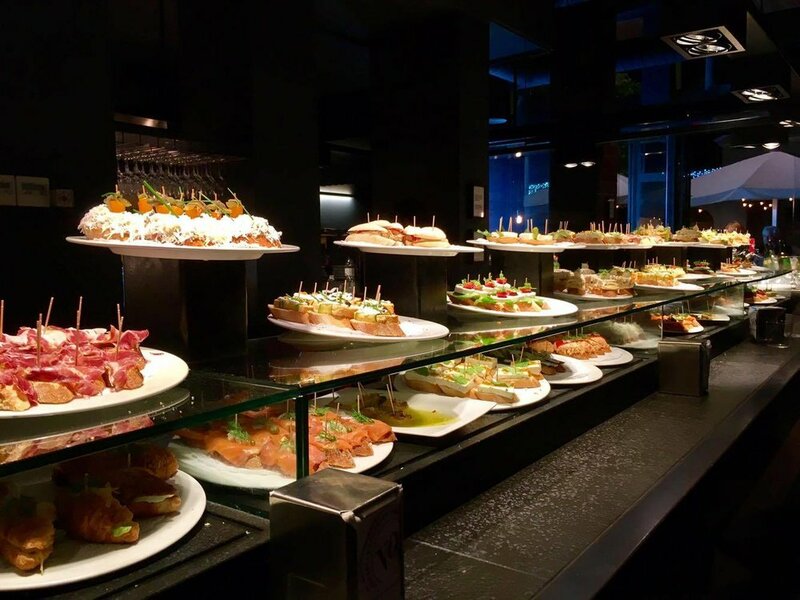 Locals say that at pinchos bars, its alarming easy to rack up a relatively hefty bill as you're drinking, talking with friends, and eating. Given the plethora of offerings, it's definitely no surprise! If my memory serves me correct, from the top moving clockwise: shaved egg white and cheese, carrot, anchovy-wrapped pickle. Egg omelette with herring, white sauce, and pickled onion. Goat cheese on a caramelized tart, topped with a sweet vinaigrette. Gilda: anchovy-wrapped chilli peppers and olives. Pate meatloaf, scallion, and caramelized onion (my favorite of the night). I happened upon Casa Gispert while taking a night-time stroll through the Gothic district, which is a very lively area, even after the sun sets. 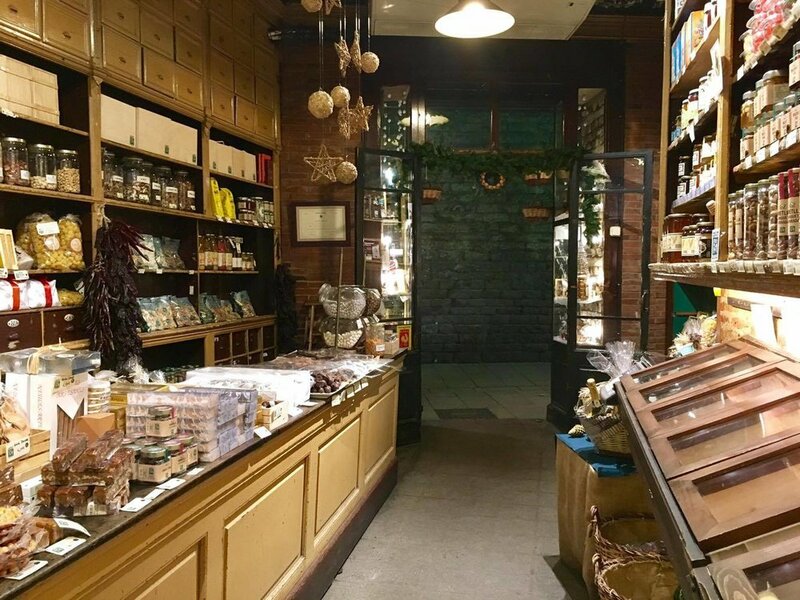 As one of Barcelona's oldest roasters, they offer a variety of dried goods, roasted nuts, and various other sweet and savory snacks. A quick note about these bronze plaques one may come across on the streets of the city. The government installed these plaques to signify stores and establishments that have had a long history of excellence in serving or selling their product. Look for these plaques if you want to know where the locales have eaten and stopped for decades past. Luckily, the weather cleared up on my second day in Barcelona. I started the morning with a trip to the Antoni Gaudí most renowned design: the Sagrada Familia. Having been under construction for over a century, the completed project is supposed to look like the below rendering. Seems like the church still has some ways to go! Though not nearly complete, the church is still a majestic structure, awe-inspiring in its multitude of symbols, shapes, curves, and lines. Two distinct facades of the church symbolize life, and death. 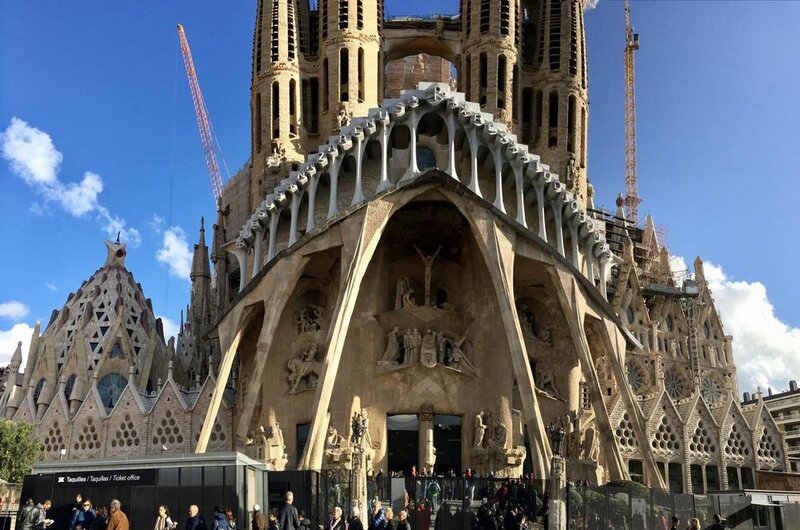 Gaudi believed that life was represented by curved lines, the nativity facade features almost no vertical or horizontal adjuncts, unlike its counterpart. The intricate details of the carved stone depicted Biblical tales. Gaudi started his project in 1882. Color fills the interior with the use of stained glass, the curvatures of interior design continues. Heading to Park Güell, I decided to stop in a local cafe for some breakfast, incidentally ordering a local specialty: Tortilla de patatas. Essentially a giant omelette with potatoes and onions, this dish is as savory as it is filling. 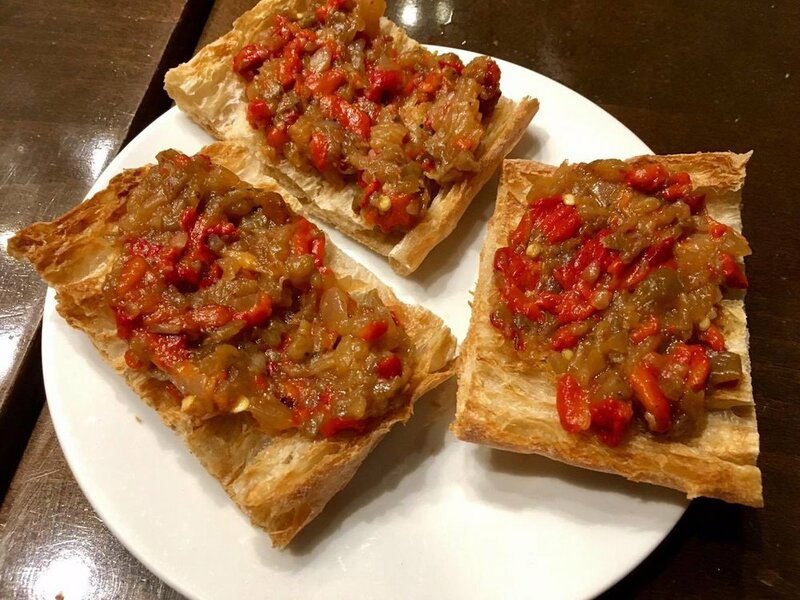 In typical Spanish fashion, the meal came with a tapas on the side, the ever-present toasted bread, dressed with tomato and olive oil. Park Güell was one of my favorite stops in Barcelona. Lines can get long as the park limits the number of visitors each hour, so I suggest the purchase of timed tickets to expedite entry! Especially on a clear day, the park's vivid colors and geometric design is a true curiosity to behold. 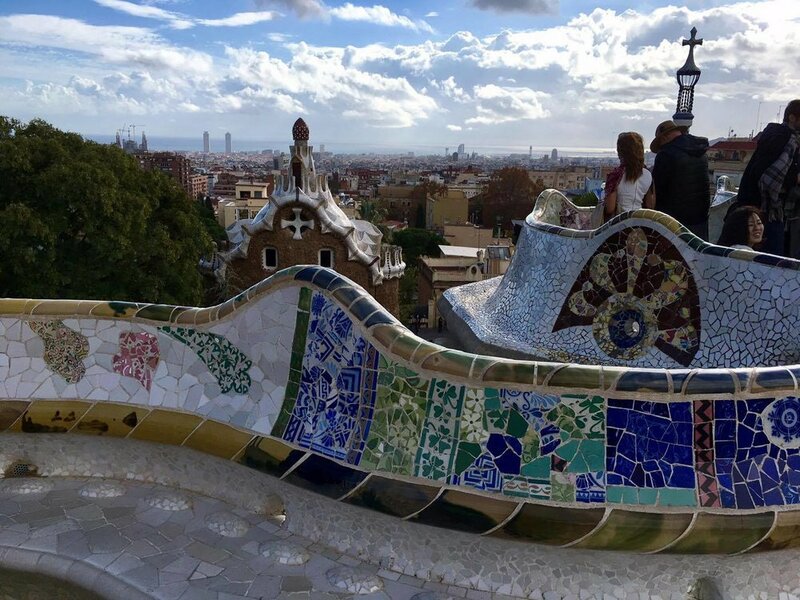 Of course, one couldn't visit without stopping at the symbolic terrance with its panoramic views of the city and variegated mosaic benches. A quick stop for lunch, featuring the long awaited paella. Arròs negre (black paella) is a native dish of Valencia, but a few restaurants make authentic, and phenomenal versions. 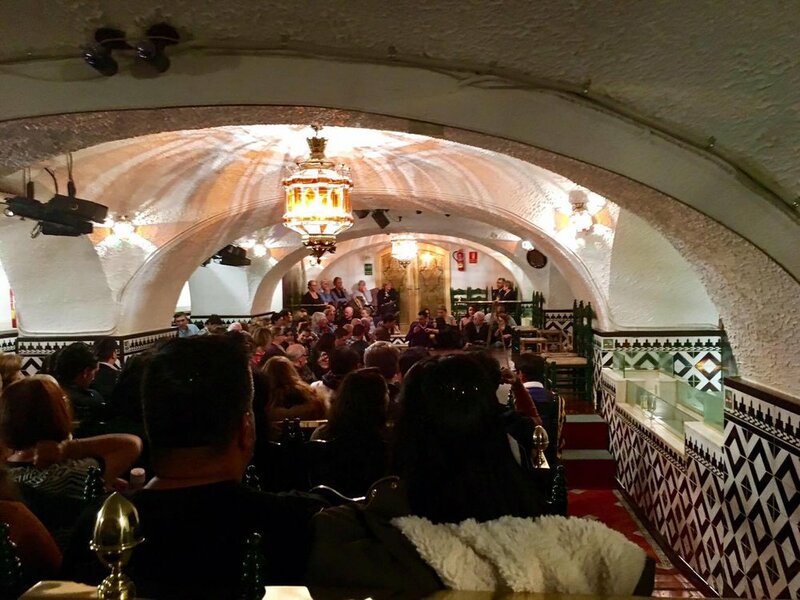 L'Arrosseria Xàtiva came highly recommended, but a reservation would be suggested in advance, especially during the weekends. The dish derives luminous black color from squid ink, much like the Italian variation featuring pasta. 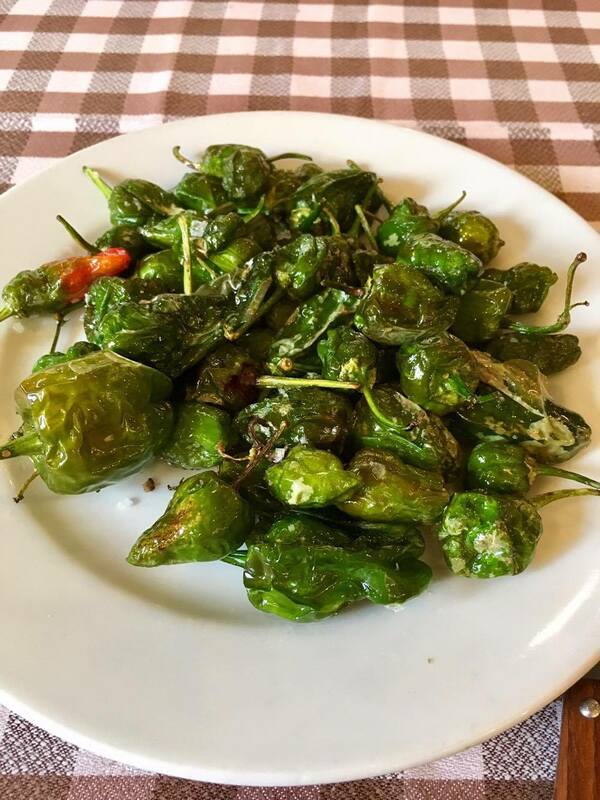 To start, fried Padron peppers were ordered. Unbeknownst to be, there is typically always one spicy pepper hidden amongst the rest. 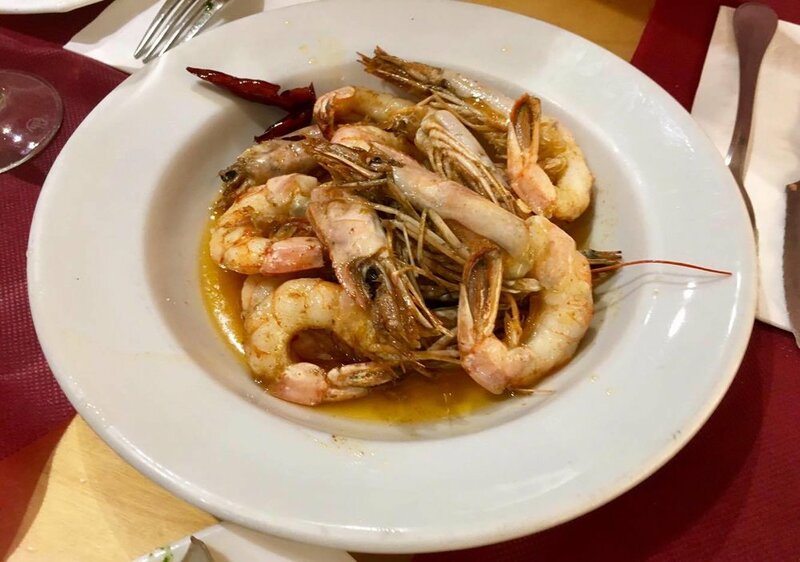 The Spanish often play a game with this dish, where friends eat from the plate and watch as the unlucky individual to bite into the spicy one squirm. I got lucky, with my very first pepper. It. was. spicy. 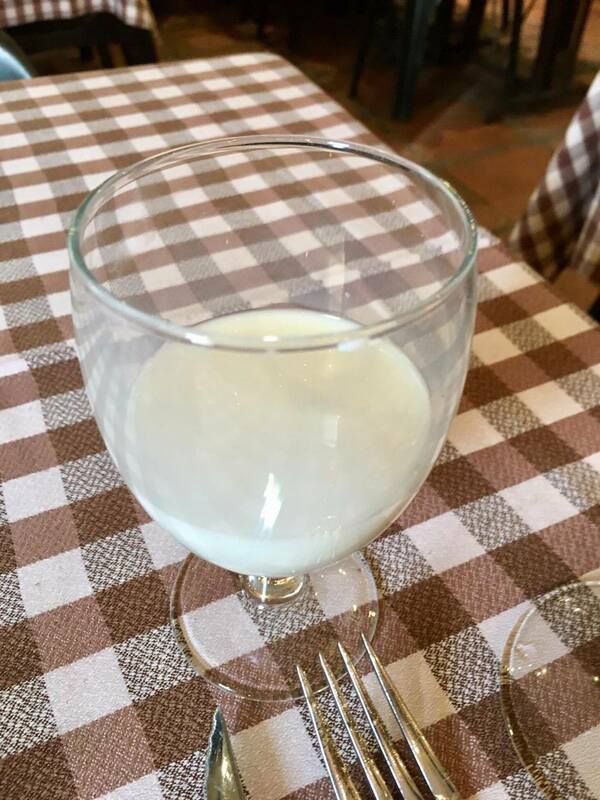 Even after the downing a entire glass of milk I requested, I could still feel my taste buds protesting in earnest. 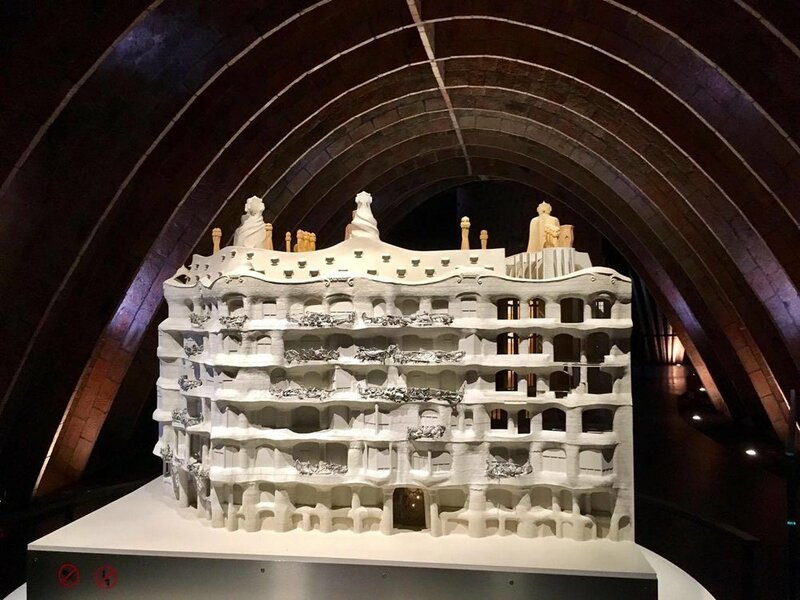 After lunch: another one of Gaudi's creations, Casa Milà, also known as La Pedrera. Constructed in the early 1900s, the facade is comprised of large blocks of limestone. Technically an apartment building, today only one family still resides within, while other units have become offices. 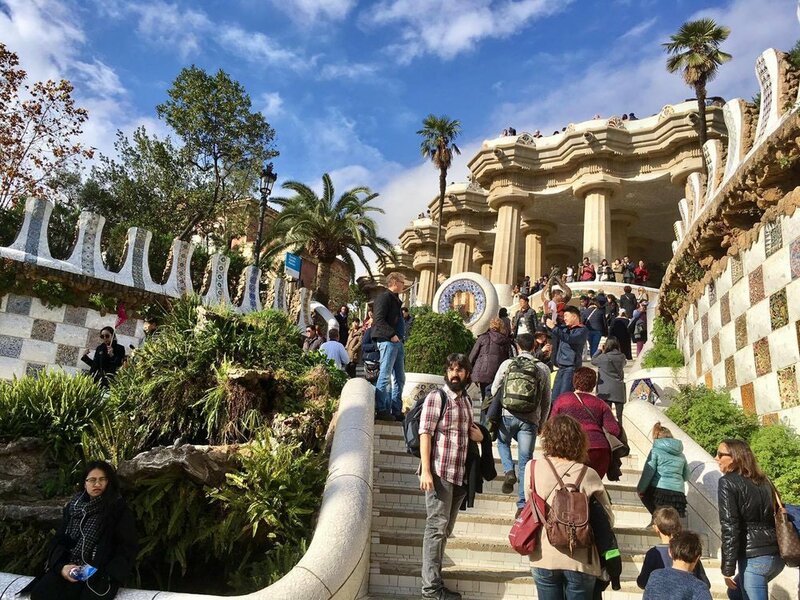 The tour begins on the terrace, which again features Gaudi's whimsical statues, much like Palau Güell. 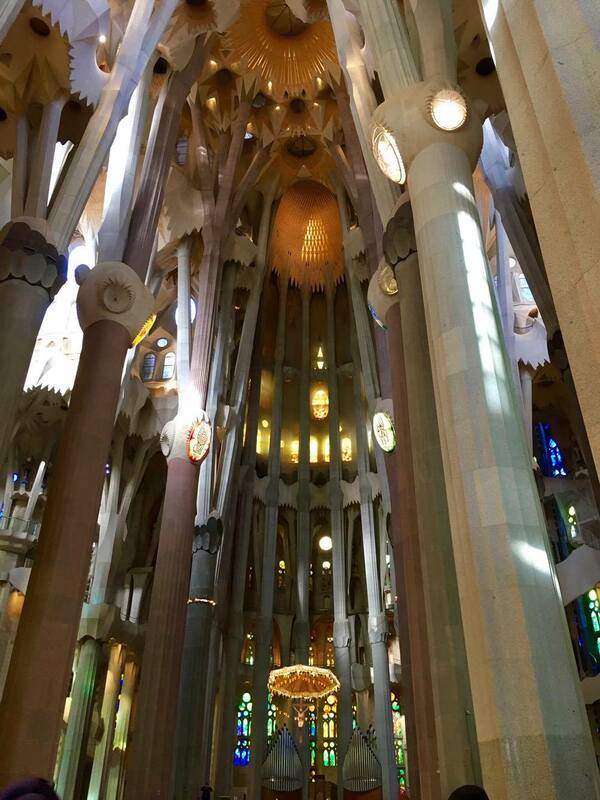 Typical of his style, Gaudi refrains from using straight lines or angular shapes in his statues. Ever the designer, Gaudi places this arch here to frame his most renowned creation, the Sagrada Familia. The church was commissioned in the late 1800s and is still under construction to this day. The very top floor of the building is also open to the public, which features replicas of the apartments below and a museum of the building. A to-scale model of the building, and a closeup of the roof. A monolithic work of art, indeed. 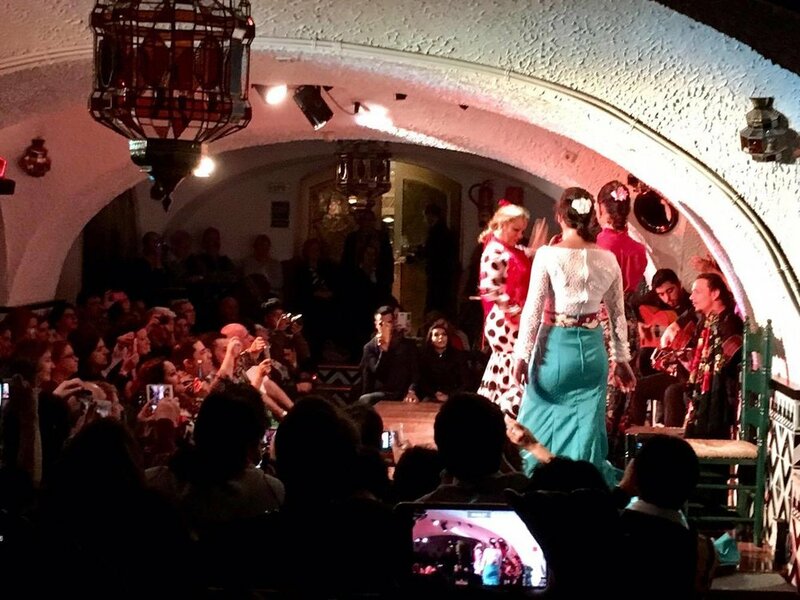 One other famed building constructed by Gaudi near La Pedrera is Casa Batlló, which I did not have time for. However, I happened to stroll by on a night-time walk, and snapped a few photos of the exterior. With the darkness and lighting, the illuminated structure seems somewhat other-worldly. Not quite dark, I took a brief tour of Museu Picasso (the Picasso Museum). No pictures allowed, but worth a visit for a comprehensive collection of the master's artwork. 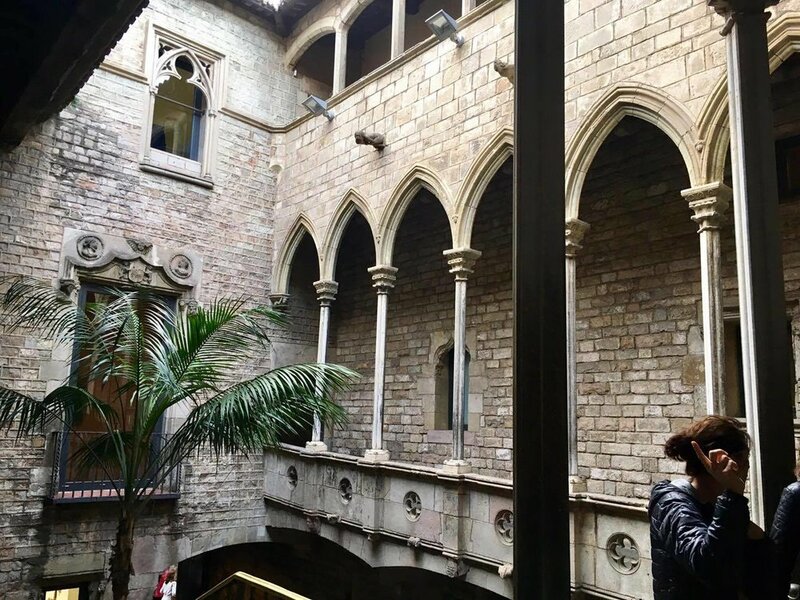 The museum's surrounding Gothic quarter happened to have some of the city's, nay, the world's best hot chocolate. When I describe Spanish hot chocolate as melted chocolate, its not a metaphor. Dipping the churros it typically comes with in the molten liquid is like coating it with a layer of chocolate. Heaven. If you, too, might enjoy drinking the equivalent of chocolate fondue, try Petritxol Xocoa on Carrer de Petritxol. Don't go in the early evenings (apparently pre-dinner snack time for the locals) to avoid a line that usually leads down the narrow cobble-stoned street its on. 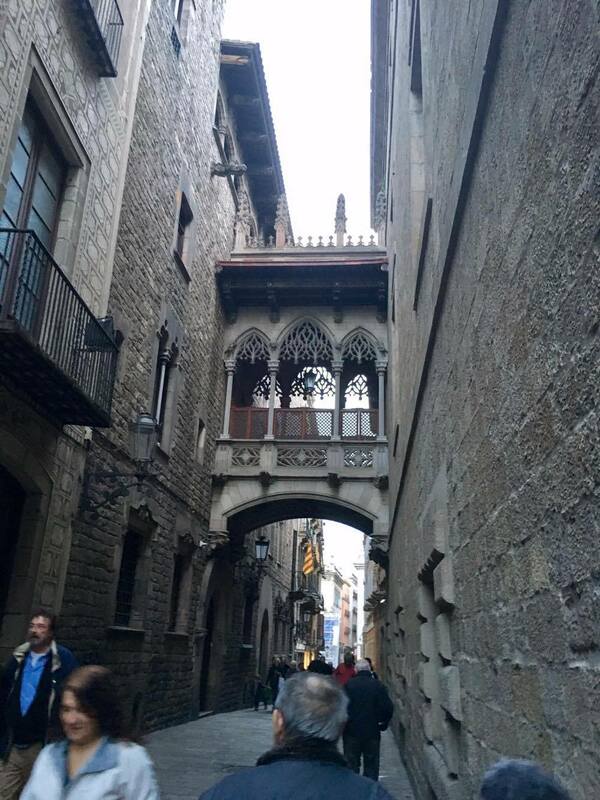 The Gothic quarter is arguably the oldest district in the city. However, not all its buildings were originally from the places they stand today. After the war, many were moved to their present-day locations so that the city can have a collective, and cohesive historical district. The city's Catedral de Barcelona, not to be confused with the Sagrada Familia! Today, the Gothic quarter's many plazas are home to various art displays and installations that juxtapose the old and new, past and present. 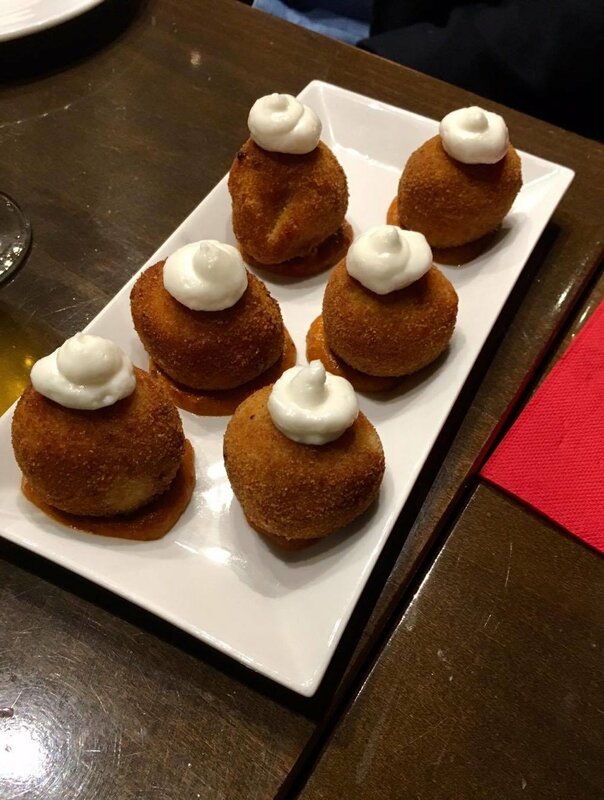 Evening, which means, of course, more tapas. As per usual, we preface with ham, cheese, and bread. As Spain is surrounded by the ocean on three-sides of the nation, seafood is featured prominently in its cuisine. A selection of notable seafood tapas; fresh, cooked simply, and a true joy to the ol'taste buds. Dip a chunk of bread in the sauce of this dish. You won't regret it. And who can forget the steamed scallops, still nestled in their shell? Finally, on to the main dinner. Yes, in this country, we haven't begun dinner yet, after all this food. This had blood, which I like, so, it was good! Octopus and potato. An unlikely but favorable combination. Main course of the night: meat and potatoes. And after all this, yes, there's still dessert. The bottom dish is a chocolate omelette, which won best dessert in the city once upon a year. Yes, it still has eggs in it - surprising. A lazy afternoon on the Sant Sebastià Beach was as picturesque as it is enjoyable. Opt for a mojito at one the sea-side bars, or another paella, perhaps. Strong gusts throughout the day drew many wind-surfers to the beach. Watching them was very tranquil, though I'm sure practicing the sport itself is less so. A drink by the beach, because what else would one do here? I'll definitely be back, and hopefully soon, but in the meantime, a few things to remind me of this city.